Winterflood Business Services (WBS) is required to establish and implement an order execution policy to allow us to obtain, for our clients, the best possible result (‘Best Execution’). The following information is aimed at providing you with a general understanding of our typical dealing arrangements. These arrangements may vary for different categories of investment types and are described below. This policy applies to all orders received from and executed on behalf of clients. Orders are routed electronically through our dealing service but, on occasion, these may be given by phone. When executing orders, unless otherwise specifically instructed, WBS will use price as the primary measure for achieving best execution. The following execution factors will be considered, and how these may be considered as part of the decision making process in the context of the details below (listed in order or priority for a typical trade). Their importance will vary depending on the characteristics of the order received from the client. Price - Price will be determined with reference to the Trading Venues to which WBS connects and on which the security is traded. We will use automatic execution technology which will source the best price from a range of retail service providers and market makers. Where an electronic price is not available the order will be dealt manually by our dealing team. Cost – for orders where brokerage or exchange fees are applicable, WBS will not seek to pass these on to clients. For international orders, certain costs (e.g. foreign exchange ‘FX’) may be passed through to the client within the price spread, but WBS deem this to still result in the best overall outcome and hence total consideration for the client. Any relevant commission rates will have been agreed with the client in advance. Likelihood of Execution and Settlement - Likelihood of execution is very high due to the relationships WBS has forged with its market maker and broker counterparties. Likelihood of settlement is difficult to assess pre-trade, but WBS monitors the settlement performance of each counterparty so there is a historical track record to base this decision on. Size - The size of the trade in relation to the liquidity of the stock may have significant influence on the Best Execution process and is directly correlated to the market impact (implicit costs). Nature - Consideration will be given to the liquidity of the stock on the order book at the relevant time. Execution may be heavily influenced by the level of on or off order book trading patterns in the stock. These factors plus the size of the order will determine the appropriate execution method. This may include the working of an order into the market place using an appropriate benchmark or immediate execution on an outright bid/offer price, for example. Speed - The importance of speed of transactions will vary. For example, to reduce the implicit costs associated with market impact, an order might be worked over a day or more. Different order types and specific instructions may also have a bearing on the speed of execution. Other Relevant Considerations – Careful consideration shall be given not just to each element in isolation, but also to the trade-off and interplay between these factors. For example size against market impact or speed against price, any of which might also be influenced by a client’s specific instruction. We will use our own commercial experience and judgement in determining the relative importance of these factors, and in general, we will regard price as the most important of these factors for obtaining the best possible result. However, we recognise that there may from time to time be circumstances for some customers, particular instruments or markets where other factors may be deemed to have a higher priority. Where the client gives us a specific instruction as to the execution of an order, we will execute the order in accordance with those specific instructions and the client should be aware that doing so may prevent us from applying this policy to achieve the best results for the client. Where the client’s specific instructions relate to only part of the order, we will continue to apply our order execution policy to those aspects of the order not covered by those instructions. Where a client trades with WBS having received a copy of this order execution policy, that trading will constitute consent to the content of this policy. While it is WBS’s intention to always trade on a Trading Venue, in certain circumstances it may be in the client’s best interests to trade away from a Trading Venue. To allow this WBS require the client’s express consent to trade in this way. A consent statement is included in respect of each of the above as part of the consent form hereto. Consent provided in relation to either of the above two paragraphs will be a general consent and will cover all trading going forward between WBS and the client. WBS may use one or more of the execution venues listed in section 4.6 to enable it to obtain the best possible outcome on a consistent basis when executing an order on the client’s behalf. We will regularly assess the execution venues available to ensure it is able to consistently obtain the best outcome for clients. For smaller orders we are able to use automatic execution technology which will source the best bid and offer from a range of retail service providers and market makers. We will then execute electronically with the provider which offers the most competitive price, with consideration to the factors noted in section 1.3. For orders above the stated sizes, WBS will use due skill and care to execute the order manually in the best interests of the client. For orders in respect of international equities, WBS will reference the price to the home market price and execute with our internal market-making business or third party broker. Where orders involve elements such as home market or non-standard settlement and/or foreign exchange, these elements will be reflected accordingly. For smaller orders, we are able to use automatic execution technology which will source the best bid and offer from a range of bond dealers. For larger orders, we may have to deal manually in order to identify current venues in the security concerned. If liquidity is available and a price comparison made for the size of trade concerned, we will execute the order with the counterparty which provides the most competitive overall pricing. For Unit Trusts and OEICs, they will generally be routed to the appropriate fund manager for execution at the next available valuation point for that particular fund. Clients’ orders may be aggregated as described in section 1.5. For the majority of our orders, we will offer the client the ability to Request For Quote (RFQ) which will hold open the price of that transaction for a small amount of time (normally 15 seconds) allowing the client to consider the price before dealing. At Best Order - Deal immediately at the best available price for that size of order based on the execution venues available, without the client viewing the price in advance. Limit Order - Deal at, or better than, the specified minimum price for sales or a specified maximum price for purchases. We will execute the client order as soon as reasonably practical in order to achieve timely execution. We may postpone the execution of the order if we have taken reasonable steps to prove that the delayed execution is in the client’s best interests. Client orders will normally be executed in the same sequence as they are received, except where there are special conditions, such as price limits or limited liquidity, where such conditions might require extra time to ensure we achieve Best Execution. All transactions, except those in Unit Trusts, Unlisted Fixed Income, other OTC instruments, OEICs and some International Securities, will be carried out and reported to an appropriate venue as detailed in section 4.6 and will be subject to the rules and regulations of that market. When selecting execution venues, we consider the price offered by the venue, the amount of any commissions and any other charges that are passed through to the client, the ability of the venue to manage complex orders including the sophistication of its systems, the speed of execution, the creditworthiness of the venue, settlement and clearing facilities, the quality of applicable regulation and any other venue characteristics relevant to the execution of the order. If we execute your order away from a Trading Venue, your trade is not subject to the rules of the relevant venue. This may result in additional risks such as delayed settlement. We will monitor the effectiveness of this policy by comparing the execution quality of each trade against the prices available at relevant Trading Venues by using a Third Party information provider. We also monitor stock coverage, quote response and settlement quality for each market maker. Formal reports can be provided on request. This policy is reviewed at least annually or more frequently as required. We will notify the client of any material change to our execution arrangements or our order execution policy by providing the client with notice to this effect in accordance with our agreement. 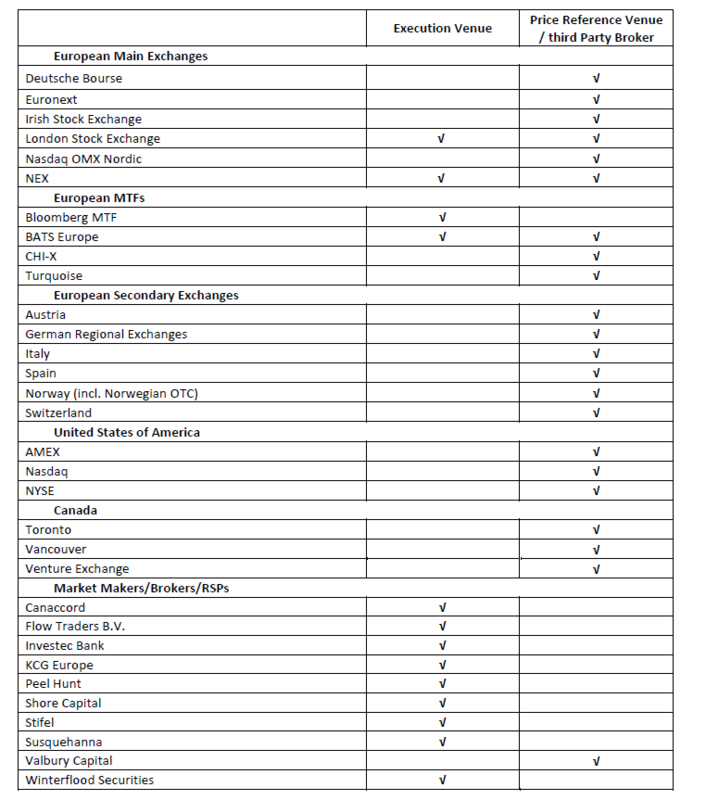 The following is a list of execution venues that WBS places significant reliance on, either directly or indirectly (via a third party) for the purpose of trading, price reference or trade reporting. We reserve the right to alter these venues from time to time.